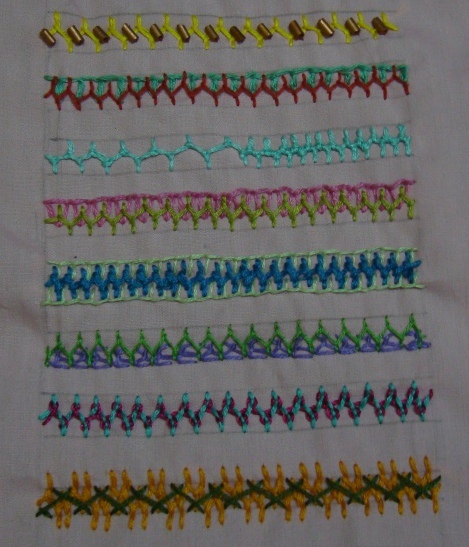 9-this row is combination of basque stitch with Cretan stitch. 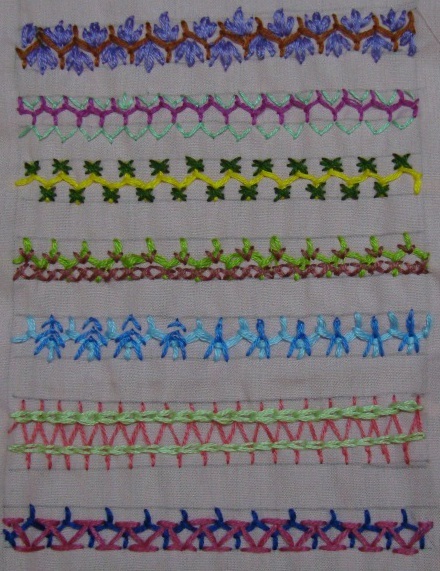 10- I tried knotted Cretan stitch in this row. 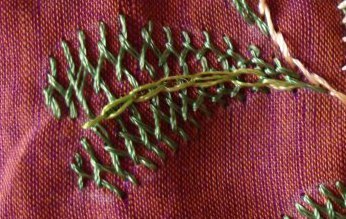 11-the working of the Cretan stitch combined with closed buttonhole stitch. 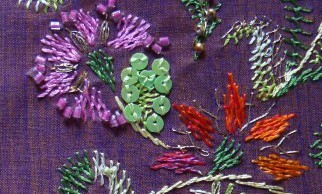 13-I tried combining cretan with bonnet stitch. 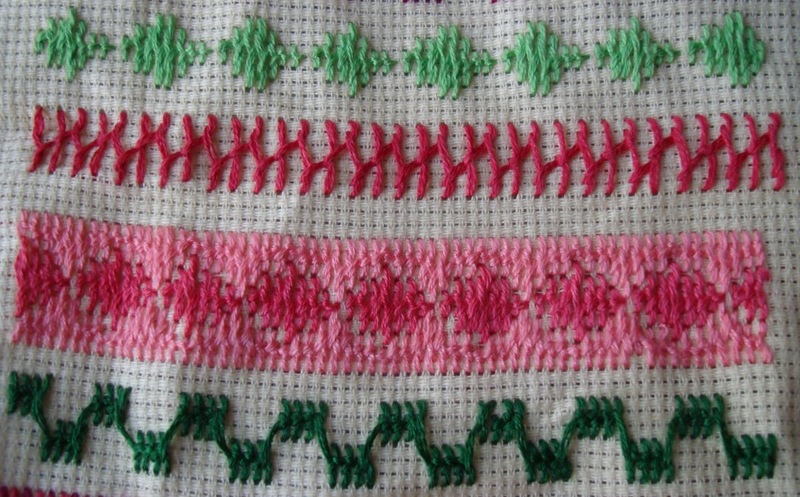 15- a variation of cretan stitch with herringbone stitch. Thank you all for your encouraging comments. It really motivates me. I really enjoy every aspect of this challenge. 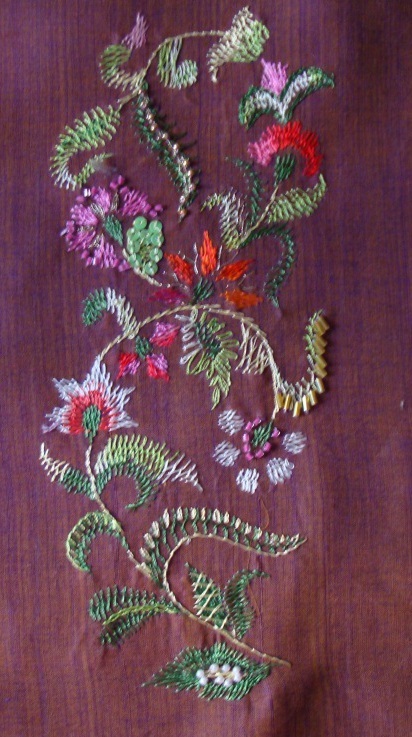 After working on the design with Cretan stitch,- the fourth week stitch of TAST challenge by SharonB. 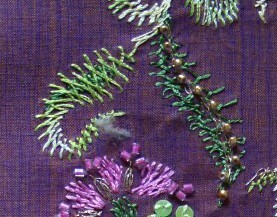 I wanted to work the stitch combined with a few other stitches. 1. 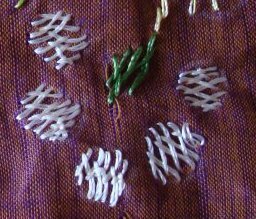 In this row I tried Cretan stitch with a set of three detached chain stitches. 2. This row the combination is with fly stitches on top and bottom. 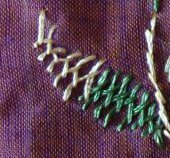 3- this line the Cretan st is worked with cross stitch and a straight stitch. 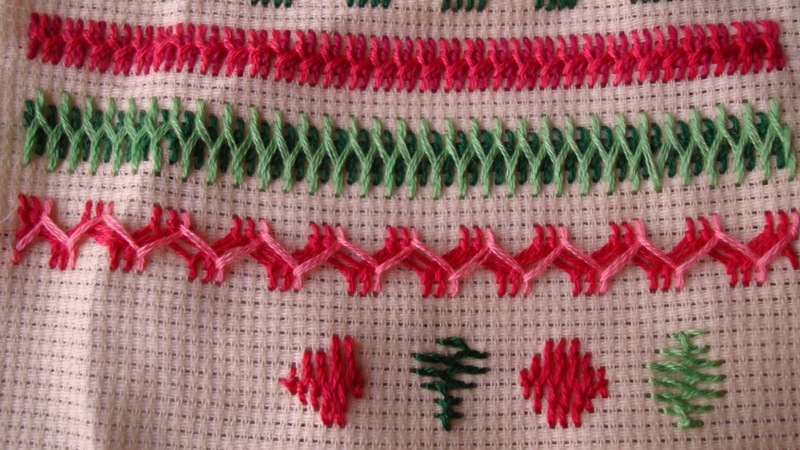 4-cretan st row with cross stitches on the bottom and v-shaped stitch on top. 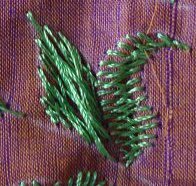 5-I tried mixing fly stitch and wheat ear stitch variation with Cretan stitch. not very satisfied with the result. 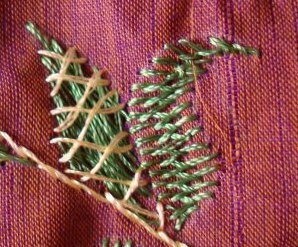 6-two rows of chain stitch is worked over the cretan stitch line. 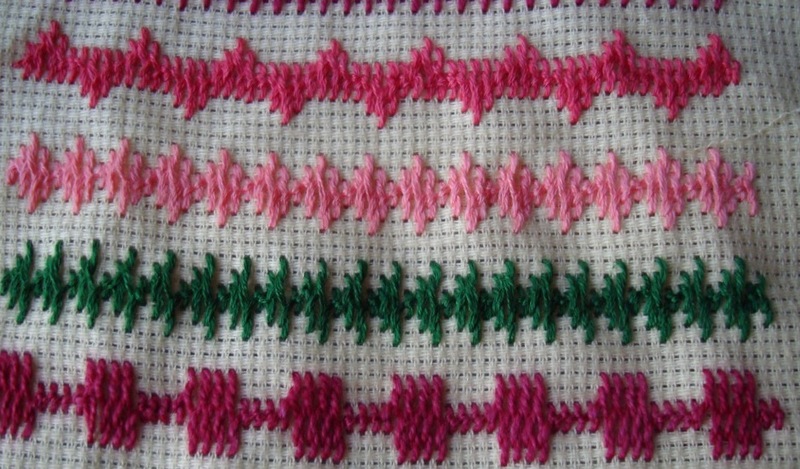 7-Cretan stitch combined with chevron stitch. Might try a few more variations, tomorrow. 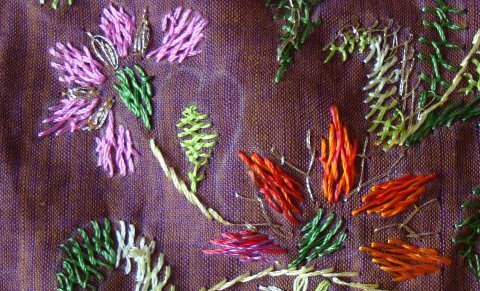 The fourth week stitch of the TAST Challenge by SharonB is Cretan. I had uploaded the pictures of my earlier sampler on my last post. 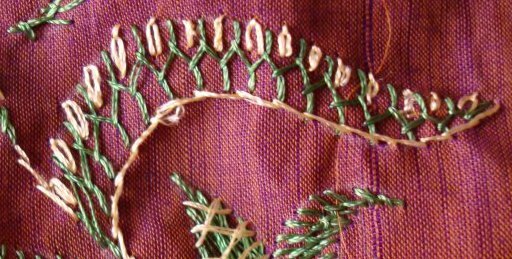 This time I thought of using this stitch on a specifically designed pattern for Cretan stitch. 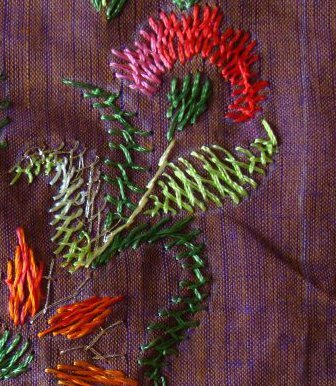 The patterns on this design are all filled with Cretan stitch and its variations, but I have also added other stitches and beads as embellishment. 2-these are filled with Cretan st in two different ways. Added herringbone st over one part of the design. 3-heart shaped pattern filled with cretan stitch. 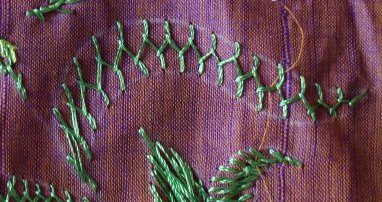 Added a line of chain stitch over it. 4- this is also another Cretan st filling. 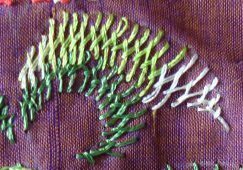 Added detached chain stitches and stem stitch. 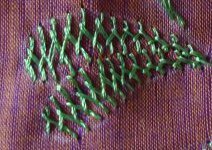 5-cretan stitch with one side stitched with buttonhole stitch. 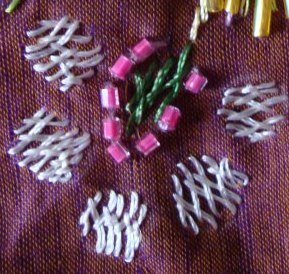 6- round shapes filled with Cretan stitch. Centre filled with Cretan st.
7-pattern filled with Cretan st in two threads. 8- this is also filled with Cretan st in two colours. 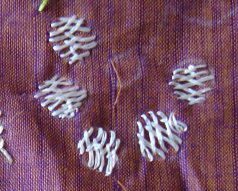 9-the two floral pattens are filled with Cretan st in different ways, the other pattern is worked with detached chain stitch waiting to be added with Cretan st.
10-these shapes are filled with cretan stitch.I just tried this stitch on different shapes. 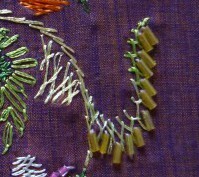 11- filled with open Cretan st.
12- another Cretan stitch filling on different shapes. 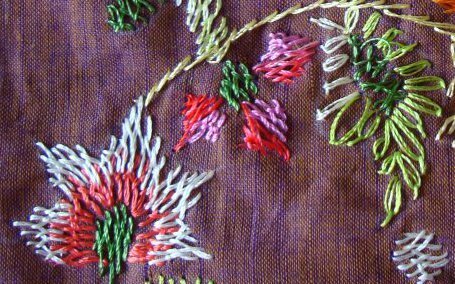 13-again filled with Cretan stitch. 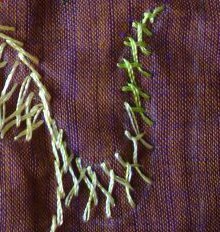 14-the paisley pattern I had worked a closed cretan stitch inside and over that worked open Cretan st. the next pattern is worked with a line of chain stitch. and some gold beads. 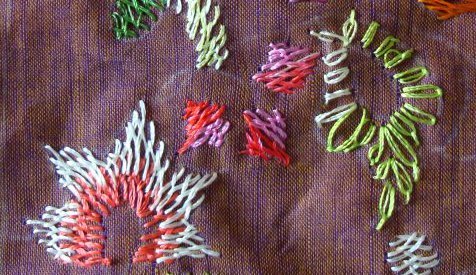 I never thought this stitch is so versatile , till I used it on this sample. learning new things everyday.